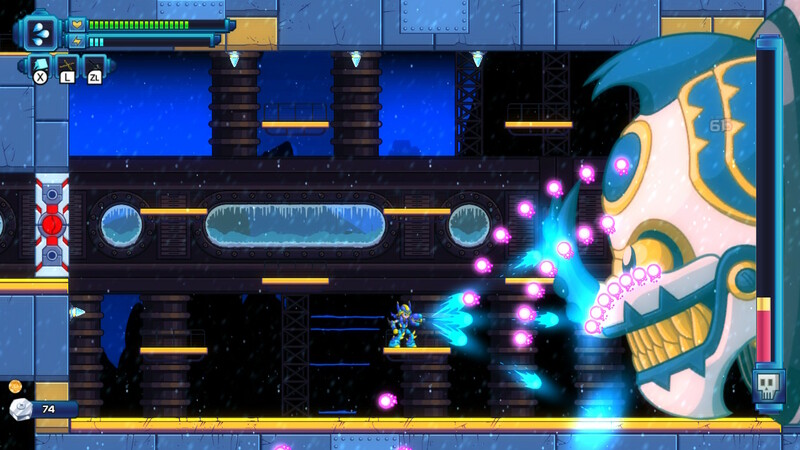 I love Mega Man, so when it came time to review 20XX, I was excited to do so. This review is based off the Nintendo Switch build, but the game is also available on the PlayStation 4, Xbox One, and Steam. Looking for a game where Mega Man X meets roguelike? Then 20XX marks the spot. 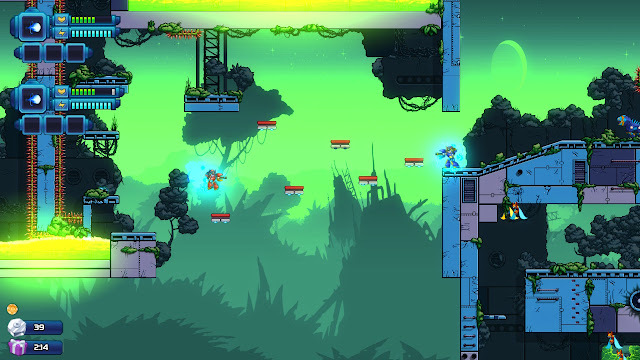 20XX is a game that combines the gameplay styling of Capcom's action-intensive Mega Man X series and combines it with roguelike sensibilities. Your goal in a given run is to move through procedurally generated levels, blasting baddies, collecting augments--which are upgrades to your character's armor, health, attack strength, speed, and so forth--beating the bosses at the end of each of the ten stages in the game, and trying to do so all in one life. The structure of 20XX has you randomly entering a stage at the start, and upon reaching its end, you face a boss. After (hopefully) defeating that first boss, you might earn a speed bonus treasure chest for quickly completing the level, as well as your choice of one of three items (either that boss's special weapon a la the Mega Man series, 10 Nuts, or a randomly chosen augment), and a selection between three teleporters leading to one of three levels with a different boss at the end of each one. Anything you can do Nina can do better, such as shooting three shots like this! Thanks, arm augment! Choosing which level and boss to tackle has some strategy. As you progress through a run in 20XX, levels and bosses become more difficult. For example, if you face the Twin Astrals boss early, which is a pair of two fire and ice ball-spewing bosses, you don't have to defeat them both in close duration to one another. Likewise, if you face them as one of the last eight bosses you need to beat before moving on to the two final stages, then you have to destroy both almost at the same time, otherwise one will revive itself in battle. My, what big... everything you have! As stated, levels are procedurally generated, taking pieces of levels and enemy placements and arranges them via an algorithm in different orders, so each time you play a level it's a unique experience. Sure, early on I caught on to the pieces of levels that were being used, at least in the initial eight levels, but the arrangements still kept me on my toes. I only wish there were more environments used in the first eight levels instead of just four--those being a jungle bio-dome, an icy base, a sky temple, and a fiery factory. While the time of day changes when you return to a level archetype, I would have loved to see more level and environmental variety regardless. Don't mind Nina--she's just hanging out. 20XX has multiple characters to play as, but you begin with either Nina or Ace. Nina is your Mega Man X clone, utilizing a powerful, long-range blaster, while Ace adheres more towards Zero's style of gameplay, using a sword for up-close and personal melee attacking. All of the tricks X and Zero have in the Mega Man X series are used by Nina and Ace, with some additions. 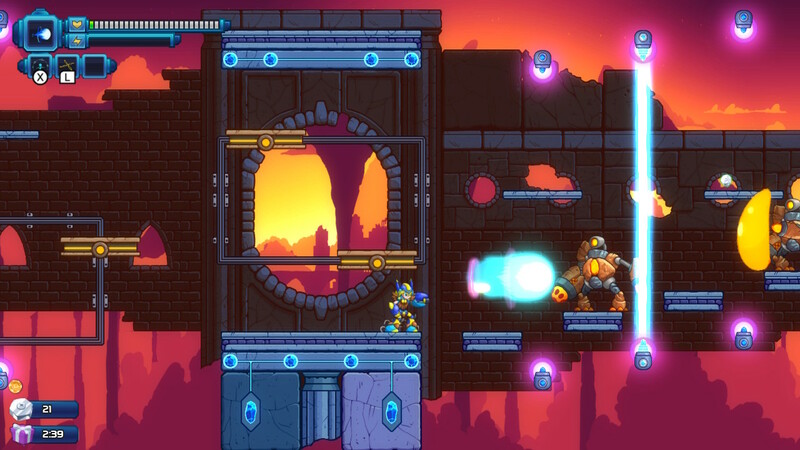 Nina and Ace can scale up walls, perform charge shots, and with special augments, they can even gain X series Dr. Light capsule-esque abilities like a double jump, hovering capabilities, faster charging, knockback protection, gaining the possibility of gaining health or energy when enemies are destroyed, and much more. The controls on display in 20XX are incredibly tight and sophisticated. 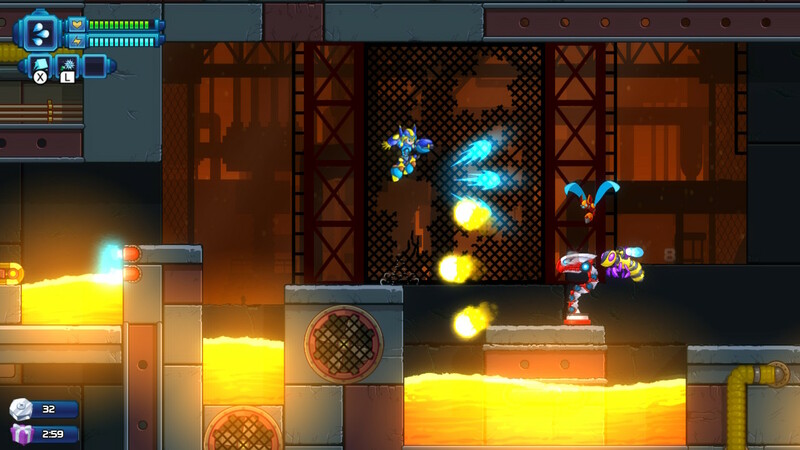 They feel smooth, and if you put Mega Man X assets into the game to replace 20XX's you'd think you were playing a game featuring the Blue Bomber turned roguelike. They're that good. Plus, you get to enjoy them with a stellar frame-rate that never stutters or slows down, even when there are a megaton of enemies and bullets moving and flying around on screen. 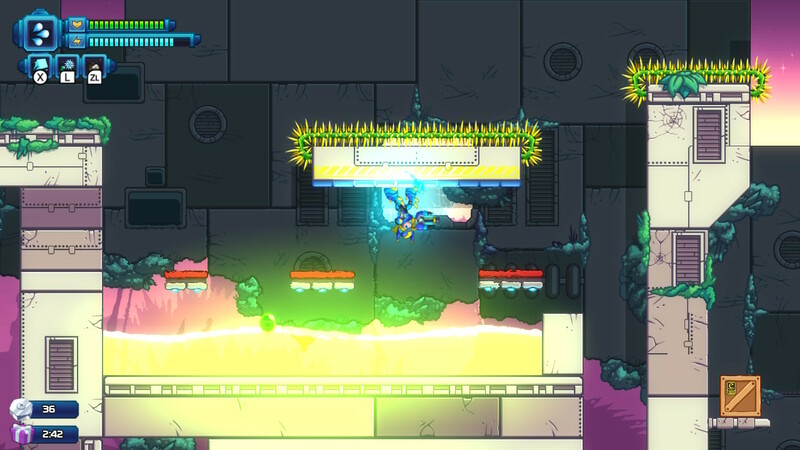 The developers of 20XX nailed both of these aspects splendidly, making for one fast and fluid action-platformer. Whether playing as Nina, Ace, or an unlockable character, the controls feel fantastic. Death, like in any typical roguelike, means your current run is over (unless it's Easy Mode, where you get three deaths to work with). The only thing you get to keep from your run are Soul Chips, one of two types of currency in 20XX. The other type is Nuts. Both are collected while playing through stages, but whereas Nuts can only be used during runs to purchase augments for your current run, Soul Chips are used outside of runs in the hub. These Soul Chips are purchased towards permanent augments, new augments to be dropped and discovered in runs, and augments for your next run only. While Nuts are more readily handed out than Soul Chips, the latter are found at the end of stages and dropped by flashing, more powerful enemies. This makes it so even if you're repeatedly failing runs--which is commonplace for a roguelike such as this--you're never really wasting your time, as you can always be buying new augments for your character in order to slowly but steadily have more health, attack power, etc. the next run. 20XX encourages repeated play-throughs, and the satisfying gameplay loop available will keep most players engaged and coming back for more. 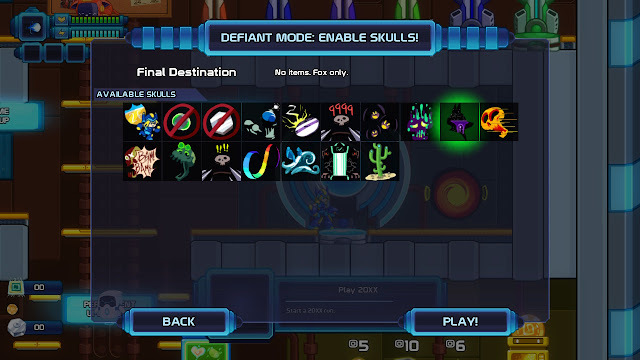 If you're feeling particularly daring, there is a Hard Mode available to play, which lowers the amount of augments you can bring into runs, as well as offers the ability to turn on more challenging modifiers to your runs. These range from double damage taken from enemies; causing spikes, lava, bottomless pits, and other similar hazards to result in instant death; enemies dropping no health items; having the game run at 150% speed; and much more. Hard Mode is already difficult, but adding a modifier or two--or several--into the mix makes for even more longevity in this already packed game. the mode's toughness is even tougher! Furthermore, the option to play cooperatively either online or locally with a friend is available. Players share the same screen, so things can zoom out quite obnoxiously. Thankfully, you can always teleport to one another for a price. In addition to that, if one player dies, the other can revive them at particular points in levels, sacrificing half their health each time in the process. My experience locally was that co-op worked extremely well. Fortunately, my experience online with co-op was just as wonderful and worthwhile. So, if you don't want to go it alone, you don't have to, which is a great option to have. Quit slowing me down! Co-op mode is a blast either online or off. 20XX significantly borrows a lot from Capcom's Mega Man X series, but at the same time, the developers made 20XX their own by incorporating unique roguelike elements into the package. The only real stumbling points of the game are its relatively lackluster Flash game-like visuals (which didn't bother me personally) and how some of the procedural generation of levels can result in some unfair platforming challenges. Nonetheless, if you're craving for a highly savory and satisfying appetizer to this month's Mega Man X Legacy Collection, or just want a great game in general, then the future is now. Review code provided by Batterystaple Games and Fire Horse Games.